Walk into any music shop worth its salt and you will observe that most guitars are American. 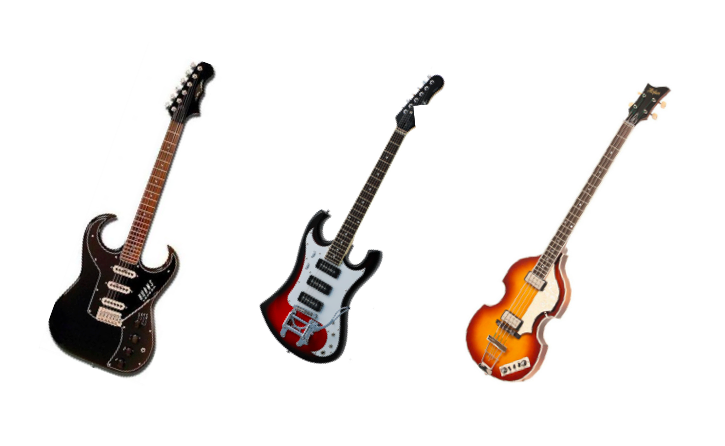 With the exception of a couple of Japanese manufacturers (Ibanez, ESP, Yamaha) and Spanish classical guitars, most of Rock ´n´ Roll has been made on American guitars. And for a good reason – they invented the genre as well as the electric guitar, and as a whole make the finest instruments available. But what about their counterpart – the European guitar? Burns from London made some pretty cool guitars: the suitably-named Bison model with bullish, inward-pointing “horns” and special Tri-Sonic pickups, famous for their receptive harmonic richness. Then there is Eko, an Italian brand known for their fancy and feature-laden guitars, with lots of buttons and knobs. And of course we all know Paul McCartney’s Höfner Bass, stylishly symmetrical for the left-handed Beatle. But the true American counterpart… surely it lies behind the Iron Curtain, where opposing political ideologies led to some unexpected guitars. And because we at Uberchord are based in East Germany’s former capital, this article will look at the GDR’s finest guitar producer: Musima. When I arrived in Berlin in late 2012, I found a semi-acoustic guitar in an antiques shop in Neukölln. 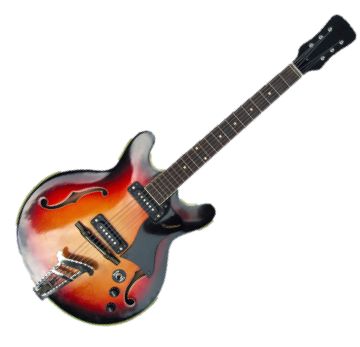 It was a sunburst ES-335 type, with a thick, cumbersome neck, an unusual vibrato system and dodgy electronics. But it was in tune, had a decent sound and had that vintage coolness that I hoped would give me credibility among Berlin’s musicians. I got my first Musima for 60€ and named it Daphne. Musima was located in Markneukirchen, close to the Czech border. The area’s Ore Mountains had the right conditions for high-grade Spruce, essential for violin and acoustic guitar-making. 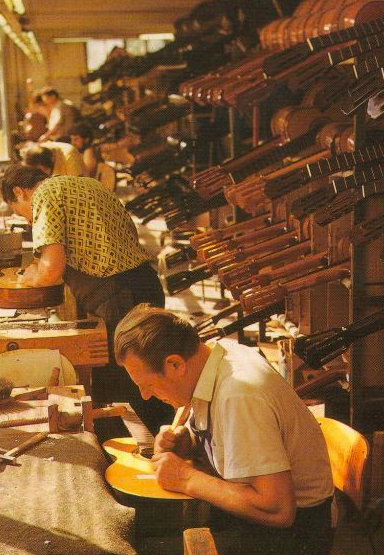 Luthiers accumulated in the area ever since the 1700s, giving Markneukirchen a distinguished pedigree. Famous for its orchestral instruments, the town probably once had the highest concentration of instrument-makers in the world. Famous for its orchestral instruments, the town probably once had the highest concentration of instrument-makers in the world. Most inhabitants were involved in crafting and trading instruments, or supplying the raw material – soon instruments bearing the Markneukirchen name became highly reputable. The communist regime after WWII brought some changes, as the government was keen to make the most of Markneukirchen’s expertise. In 1952 Musima was created as a cooperative, centralizing many of the town’s craftsmen and family enterprises under a collective management. Keen to make Musima into an example of communist industry, the East German government supported the company, which quickly grew into the biggest in the GDR. 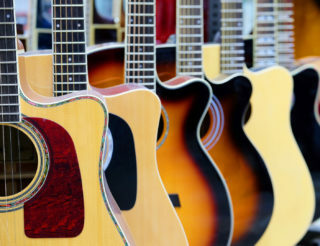 With 1200 employees in the 1980s and a peak production of 360 guitars per day, Musima was exporting electric and acoustic guitars to 53 countries around the globe. Earlier Musimas were generally considered decent, value for money guitars. The instruments of higher quality, made by the more experienced craftsmen, were mostly reserved for export. These were often beautiful guitars with innovative designs, even if the GDR machinery and electronics could not match their US counterparts. The solid-body Elektrina, released during the early 60s, borrowed considerably from the violins the company continued manufacturing. The upper section of the body resembled a cello, giving the instrument an elegant, modernist aesthetic. The guitars are however best known for their archtop designs. They sound soft but sparkly through the Soviet era single coil pickups (slightly wider and warmer-sounding, but still with single coil twinkle), even if their thick neck and high action makes them strange to play. But what most distinguish them are their looks. 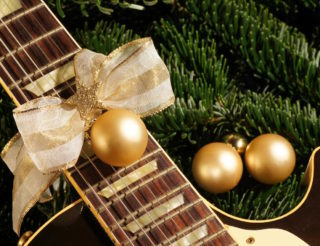 Unusual paint jobs, such as gold sparkle or zebra-striped in shades of purple, often spray-painted or by sticking thick pearloid onto the wood, give the guitars a sometimes beautiful (other times garish) look. And some guitars have bold F-holes resembling a sweeping fu-manchu moustache or thunderbolts. Foreign imports were often in short supply: when the exotic rosewood ran out (needed for fretboards), Musima resorted to locally-produced pear wood. Stained black, this cheap substitute actually had properties remarkably similar to rosewood. Another anecdote concerns the truss rod. Musima’s guitar-makers could not figure out how to make the guitar neck thinner. Finally, they managed to get authorisation to acquire a Burns electric and import it to East Germany (most Western goods were considered contraband at the time). However, when the coveted English instrument finally arrived at Markneukirchen, Musima’s luthiers were prohibited from taking this expensive, state-sponsored guitar apart. They had to take it to a nearby hospital, where X-rays revealed the secret workings of the illusive truss rod. The Musima factory closed its doors pretty soon after reunification, simply because it could not compete on a free global market. Most musicians agree that they are not the best sounding, most playable guitars – sometimes they are not even the most beautiful, being frequently considered cheesy or kitsch. They are authentic vintage, a remnant from another time. They are authentic vintage, a remnant from another time. 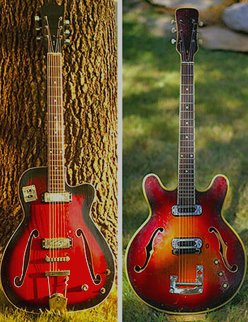 When you pick up a Musima, you cannot deny the story that these guitars tell. They bear the marks of previous owners, many of whom would have rocked out to forbidden western rock tunes to momentarily escape the authoritarian regime. Maybe these guitars were more than just instruments; maybe they symbolised the hope of freedom. In Berlin you can still find Musimas (a good place is www.vintageaudioberlin.de on Schönhauser Allee 28). And while instrument-making in Markneukirchen has diminished, the town’s spirit for excellence lives on: a young man named Christian Frederick Martin emigrated from here to Pennsylvania in the early 1800s and founded C.F. 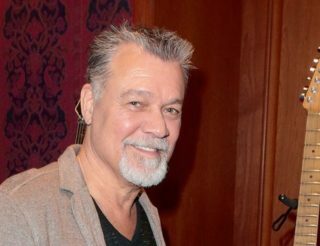 Martin & Co., one of the best acoustic guitar companies in the world – his expertise came from Markneukirchen. hey i own a musima classical guitar ..i bought it a couple of years ago from a friend …i have always wondered about its history.. it says it was made in the republic of Germany. it still sounds great…i don’t know how it found its way here(Ethiopia) its really amazing..who knew it goes as back far as the 70s. I bouth a musima yestyerday on a secondhand market. its a musima leadstar with a gravure in de neckplate Lucille. Its colour is light yellow. The vendor sais it has to be from the late 60’s. theres a tuner missing. can anybody tell me where i can find these tuners. They have a lot of musimas and are proper guitar geeks, so if they don’t stock the parts they will certainly know where you can get them.